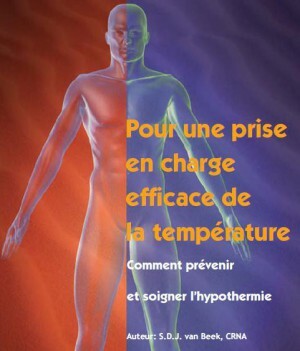 Hypothermie profonde: Pourquoi pas ? Moffatt ES. et Al. J R Army Med Corps. 2017 May 11. pii: jramc-2016-000723. Survival in exsanguinating cardiac arrest patients is poor, as is neurological outcome in survivors. 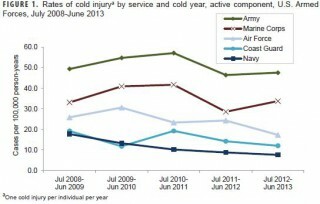 Hypothermia has traditionally been seen as harmful to trauma patients and associated with increased mortality; however, there has been speculation that cooling to very low temperatures (≤20°C) could be used to treat haemorrhagic trauma patients by the induction of a suspended animation period through extreme cooling, which improves survival and preserves neurological function. This has been termed emergency preservation and resuscitation (EPR). A systematic review of the literature was used to examine the evidence base behind the use of deep and profound hypothermia in haemorrhagic shock (HS). It included original research articles (human or animal) with cooling to ≤20°C after HS or an experimental model replicating it. Normovolaemic cardiac arrest, central nervous system injury and non-HS models were excluded. Twenty articles using 456 animal subjects were included, in which 327 were cooled to ≤20°C. All studies describing good survival rates were possible using EPR and 19/20 demonstrated that EPR can preserve neurological function after prolonged periods of circulatory arrest or minimal circulatory flow. This additional period can be used for surgical intervention to arrest haemorrhage in HS that would otherwise be lethal. Conclusions The outcomes of this review have significant implications for application to human patients and the ongoing human clinical trial (EPR for Cardiac Arrest from Trauma). Current evidence suggests that hypothermia ≤20°C used in the form of EPR could be beneficial to the HS patient. Accidental hypothermia-an update : The content of this review is endorsed by the International Commission for Mountain Emergency Medicine (ICAR MEDCOM). 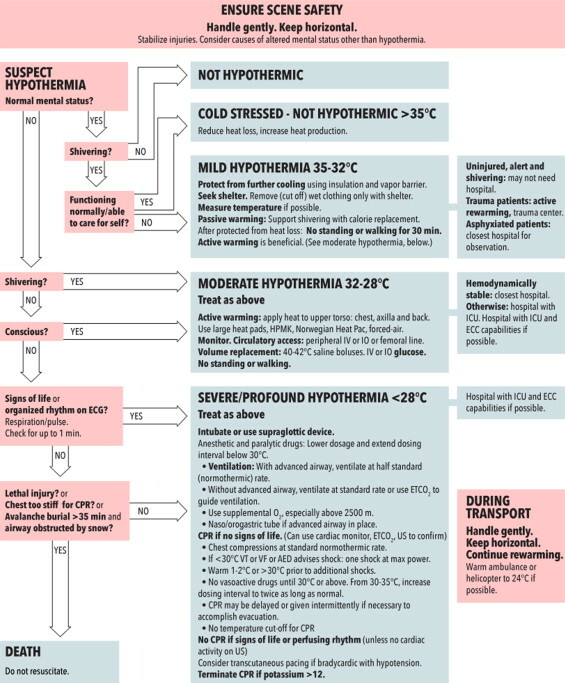 Based on new evidence, additional clinical experience and clearer management guidelines and documentation, the treatment ofaccidental hypothermia has been refined. ECLS has substantially improved survival and is the treatment of choice in the patient with unstable circulation or cardiac arrest. Hyporthermie: Il faut envelopper ! 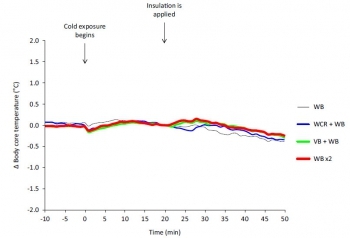 The purpose of this study was to evaluate the effect of wet clothing removal or the addition of a vapor barrier in shivering subjects exposed to a cold environment with only limited insulation available. 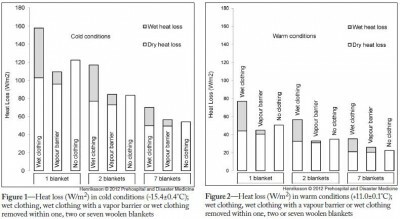 Volunteer subjects (n ¼ 8) wearing wet clothing were positioned on a spineboard in a climatic chamber (–18.51C) and subjected to an initial 20 minutes of cooling followed by 30 minutes of 4 different insulation interventions in a crossover design: 1) 1 woolen blanket; 2) vapor barrier plus 1 woolen blanket; 3) wet clothing removal plus 1 woolen blanket; or 4) 2 woolen blankets. Metabolic rate, core body temperature, skin temperature, and heart rate were continuously monitored, and cold discomfort was evaluated at 5-minute intervals. 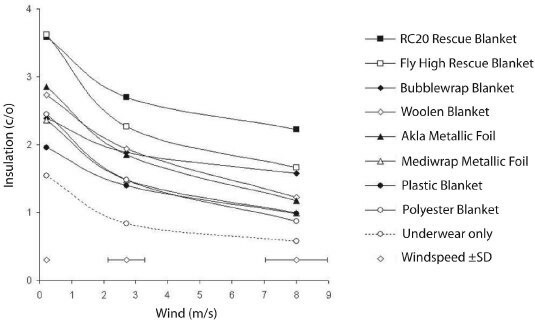 Wet clothing removal or the addition of a vapor barrier significantly reduced metabolic rate (mean difference  SE; 14  4.7 W/m2 ) and increased skin temperature rewarming (1.01  0.21C). Increasing the insulation rendered a similar effect. There were, however, no significant differences in core body temperature or heart rate among any of the conditions. 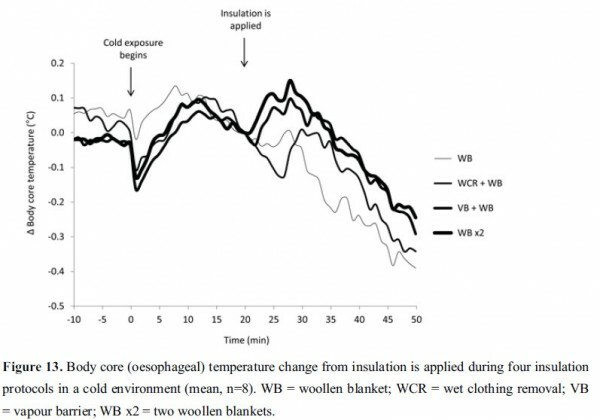 Cold discomfort (median; interquartile range) was significantly lower with the addition of a vapor barrier (4; 2–4.75) and with 2 woolen blankets (3.5; 1.5–4) compared with 1 woolen blanket alone (5; 3.25–6). Doit être remarqué la recommandation de ne pas mobiliser le blessé hypotherme pendant au moins 30 min après la mise en oeuvre des techniques de réchauffement. Ceci a pour objet de limiter les effets de l'afterdrop, mécanisme par lequel le réchauffement peut transitoirement aggraver l'hypothermie centrale par un mécanisme de recirculation de sang froid. 1. The key factors to guide treatment are level of consciousness, shivering intensity, and cardiovascular stability, based on blood pressure and cardiac rhythm Core temperature can provide additional helpful information (panel consensus). 2. A patient who is shivering but able to function well and to care for himself or herself is unlikely to be hypothermic. A patient who is shivering, becoming incapacitated, and having difficulty caring for himself or herself is likely to be hypothermic. If there is any doubt, assume that the patient is hypothermic (panel consensus). 3. 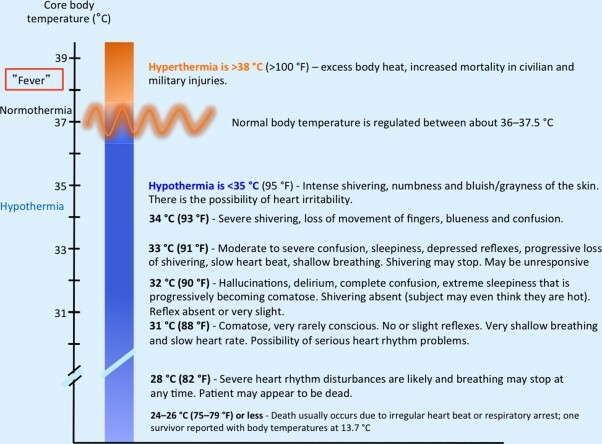 Because the temperature ranges to which the HT grades are meant to correspond are the same as the standard classification, rescuers should refer to mild, moderate, severe, and profound hypothermia (<24°C) on the basis of their clinical observations, remembering that shivering can occur below 32°C, usually with altered mental status, and that patients can have detectable vital signs with core temperatures below 24°C (panel consensus). 4. Clinicians should consider causes other than hypothermia to explain altered mental status or lack of shivering that does not correlate with the measured core temperature or by a history of minimal cold exposure (panel consensus). 5. In a patient whose airway has been secured with an endotracheal tube or with a supraglottic airway that has a port for placing a gastric tube, use esophageal temperature monitoring with the esophageal temperature probe inserted into the lower third of the esophagus (1C). 7. Rectal temperature should not be measured in the field until the patient is in a warm environment (1C). 8.Use oral temperature measurement with a thermometer (electronic or liquid-filled) that can read below 35°C only to rule out hypothermia (1A). 9. Monitor rectal or bladder temperature during rewarming of an unconscious patient only if an esophageal or epitympanic probe is not available. If rectal or bladder temperature is used for monitoring during rewarming, allow for inaccuracy owing to the time lag behind core temperature changes (1A). 11. The decision to rescue or to resuscitate a potentially severely hypothermic patient should only be made after the scene is secure and safe for the rescuers to enter and make an evaluation (1A). 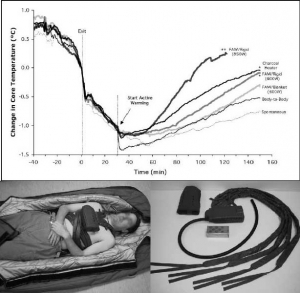 After safety of rescuers has been assured, the priorities in out-of-hospital treatment of a hypothermic patient who is not in cardiac arrest are to avoid causing cardiovascular collapse during rescue, to prevent a further decrease in core temperature (afterdrop), and to rewarm the patient in a safe manner. If a hypothermic patient is in cardiac arrest, rescuers should initiate resuscitation, if indicated. 12. Rescuers should keep a hypothermic patient horizontal, especially during rescue from water or from a crevasse (1B) and should limit physical effort by the patient during rescue (1B). A conscious patient should be encouraged to be vigilant and focus on survival (1C). 14. Protect from further cooling by using insulation and a vapor barrier until the patient has reached a warm environment, such as the interior of an ambulance. Remove wet clothes, preferably by cutting them off, only when the patient has been protected from the cold (1C). 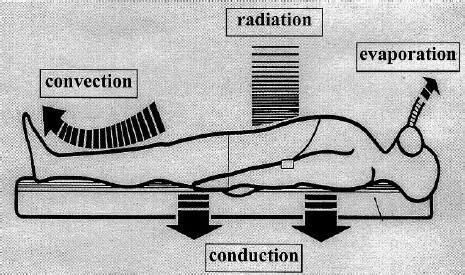 Take special care to insulate the patient from the ground (eg, with sleeping pads) to protect from conductive heat loss and also to protect the head and neck by closing the area around the face as effectively as possible (1C). 15. Use an outer windproof layer to protect the patient from wind and especially from rotor wash when loading or unloading from a helicopter (1C). 17. An alert patient who is shivering, and who is not at risk for aspiration, should receive high-carbohydrate liquids and food. Liquids and food may be warmed but should not be hot enough to cause burns (1C). 20. Large heat pads should be used, if available (1B). Rewarming devices should be used in conjunction with vapor barriers and insulation (1C). The HeatPac should only be used outdoors or with proper ventilation that is carefully monitored (1B). 21. Body-to-body rewarming can be used in mild hypothermia to increase patient thermal comfort if enough personnel are available and if it does not delay evacuation to definitive care (1B). 22. Apply heat sources to the axillae, chest, and back. A large heat pad or blanket should be placed over the chest and, if large enough, extended into the axillae and under the back (1B). Additional heat, if available, can be applied to the neck if precautions are taken to prevent heat loss through any neck opening (1C). Avoid applying external heat to the extremities, although it is not necessary to insulate the arms from heat applied to the torso (1B). 23. The HPMK can be used as a convenient and effective means of preventing heat loss and providing active external rewarming (1C). 24. Avoid localized pressure to cold skin. Heat should never be applied directly to the skin. A barrier should be used to prevent burning the skin when using chemical or electrical heat pads or warm water bottles (1C). 25. Do not use small chemical heat packs for rewarming a hypothermic patient (1B). Small chemical heat packs can be used to prevent local cold injury to the hands and feet during treatment and transport (1C). 26. Heated humidified oxygen can be used in combination with other rewarming methods (2C), but should not be relied on as the only rewarming method (1B). 27. Do not use a warm shower or bath for rewarming, even if a patient appears to be only mildly hypothermic (1C). 28. Distal limb warming to the elbows and knees in 421C to 451C water can be used for rewarming a patient with mild hypothermia (1C). 29. Forced-air warming should be used during air or ground transport, if available (1A). If forced-air warming is not available, use of heat pads, including the HPMK, can be continued. Care must be take to prevent CO buildup with the charcoal HeatPac in a ground ambulance; this can be done by igniting the device outside the vehicle, bringing it inside only after initial smoke production subsides, ventilating the vehicle compartment, and monitoring CO (1C). HeatPac should not be used in an aircraft (1C). 30. Patient compartments in ground and air ambulances should be heated to at least 241C, if possible, to decrease further heat loss (1C). 31. A cold-stressed patient who is not hypothermic does not need to be kept horizontal. The patient may be allowed to remove his or her own wet clothing and to put on dry clothing without shelter, if necessary. The patient may be allowed to rest in a sitting position, to eat and drink to maintain energy reserves and hydration, and may move or keep moving, if necessary (panel consensus). 32. Fixed, dilated pupils, apparent rigor mortis, and dependent lividity are not contraindications to resuscitation of a severely hypothermic patient (1A for fixed, dilated pupils and apparent rigor mortis; 2C for dependent lividity). If there are no contraindications to cardiopulmonary resuscitation (CPR), rescuers should not give up hope and should attempt resuscitation (1A). 33. Do not attempt to resuscitate a patient with obvious fatal injuries or whose chest wall is too stiff for compressions (1A). 34. Do not attempt resuscitation in an avalanche victim buried for 35 minutes or longer with an airway that is definitely obstructed by snow or ice (1A). 35. Rescuers should make every effort to move the patient to a warm setting, such as a ground or air ambulance or a medical facility where cardiac monitoring is available to guide resuscitation and to start rewarming (1C). Before starting CPR, feel for a carotid pulse for 1 minute. If there is no detectible pulse after 1 minute, start CPR, including rescue breathing (1C). 36. CPR should be started if a nonperfusing rhythm, including ventricular tachycardia (VT), VF, or asystole, is detected. If there is a cardiac rhythm with organized QRS complexes (other than VT), CPR should not be performed (1C) unless ETCO2 monitoring confirms lack of perfusion or echocardiography shows that there are no cardiac contractions corresponding to electrical activity (1B). 37. If shock is advised by the AED, attempt defibrillation and start CPR. If no shock is advised on an AED, no carotid pulse is found after palpating for at least 1 minute, normal breathing or other signs of life are not observed, and ultrasound is not available to verify cardiac activity or pulses, start CPR (1C). 38. In patients with severe or profound hypothermia, CPR can be delayed (“scoop and run”) and can be given intermittently during evacuation if it is not technically possible or safe to perform continuous CPR (1C). CPR can be given for several hours, if necessary (1B). 39. If there is no contraindication to CPR and no indication to terminate CPR, continue resuscitation attempts in a patient even if the core temperature is below 101C measured by an esophageal probe in the lower third of the esophagus (2C). 40. If a cardiac monitor is available, use maximal amplification to search for QRS complexes (1C). 41. If a monitor or defibrillator shows VT or VF or if shock is advised by an AED in a patient whose core temperature is thought to be below 301C, give a single shock at maximal power (1C). 42. Wait until a patient has been rewarmed at least 11C to 21C or to 301C before attempting further shocks (2C). Once the core temperature reaches 301C, follow defibrillation guidelines for normothermic patients (1C). 43. For cardiac arrest in a hypothermic patient, deliver chest compressions at the same rate as in normothermic patients (1C). 44. In the absence of ETCO2 monitoring, deliver ventilations at the same rate recommended for a normothermic patient,11,17 unless an advanced airway is in place (see below) (2C). 45. gement. Recommendation. In a patient with an advanced airway, if ETCO2 monitoring is not available, deliver ventilations at half the rate recommended for a normothermic patient to avoid hyperventilation (1C). 46. If ETCO2 monitoring is available, keep ETCO2 within the normal range. In rescues at altitudes above 1200 m, ALS personnel should be aware of the normal range of ETCO2 at a given altitude (1C). 47. High-quality CPR can be performed effectively during prolonged transport using a mechanical device (1C). 48. The advantages of advanced airway management outweigh the risk of causing VF (1C). A nasogastric or orogastric tube should also be placed to decompress the stomach, after the airway is secured (1C). 49. 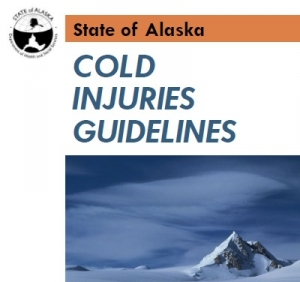 Below a core temperature of 301C, dosages of anesthetic and neuromuscular blocking agents should be lowered and intervals extended according to the degree of hypothermia. Current data are insufficient to recommend specific protocols (1C). 50. A hypothermic patient may receive supplemental oxygen, especially at altitudes greater than 2500 m. There is potential benefit and no known harm (1C). 51. If circulatory access cannot immediately be obtained with a peripheral IV catheter, access should be obtained by the IO method (1C). Central venous access can be obtained using a femoral line if no other option is available (1C). 52. Resuscitate a hypothermic patient with normal saline warmed to 401C to 421C given IV or IO. Use caution to prevent volume overload (1B). 53. When practical, fluids should be given as boluses rather than by continuous infusion (1C). The goal of fluid administration should be to maintain systolic blood pressure at a level that provides adequate perfusion, depending on the degree of hypothermia (1C). 54. Glucose should be administered to a hypothermic patient who is hypoglycemic (1A). Insulin is not initially indicated for hyperglycemia (1B). If glucose testing is not available, IV glucose can be administered empirically to a hypothermic patient with altered mental status (1C). 55. Transcutaneous pacing may be beneficial in hypothermia in the setting of bradycardia with hypotension disproportionate to the core temperature (2C). 56. No treatment is indicated for atrial dysrhythmias in a hemodynamically stable patient during rewarming (IB). 57. A severely injured patient should be treated early and aggressively with active rewarming during all phases of out-of-hospital care to prevent hypothermia (1B). 58. To prepare a patient for transport, potential spinal injuries should be stabilized105 (1C). Fractures and dislocations should be reduced as much as possible to normal anatomic configuration (1C). Open wounds should be covered (1C). 59. An uninjured patient who is completely alert and shivering may be treated without being transported to a hospital (1B). 60. If injuries meet trauma criteria, a patient should be transported to a trauma center (1B). An asphyxiated patient should be transported to a hospital for observation (1B). 61. A patient with moderate to severe hypothermia who is hemodynamically stable can be transferred to the closest hospital or other appropriate medical facility such as a rural clinic (1C). A patient who is hemodynamically unstable or who has a core temperature less than 281C should be transferred to a hospital capable of providing critical care and ECC, if possible. If this will require significant additional time—generally more than an additional hour—of non– critical care transport the patient should first be stabilized at a closer facility (1C). A patient in cardiac arrest should be transferred to a hospital capable of providing ECC if possible. If all other factors are equal, ECMO is preferable to CPB (1B). In geographic regions where there is no hospital capable of providing ECC or when a hospital capable of providing ECC is not accessible, transport a patient in cardiac arrest to the closest hospital where serum potassium can be measured and where resuscitation methods not involving ECC can be attempted for a patient whose serum potassium is 12 mmol/L or less. (Please see following section for use of biochemical markers.) (1C). 62. If an adult hypothermic patient has a potassium greater than 12 mmol/L, CPR should be terminated (1B). 63. An avalanche victim buried 35 minutes or less or with a core temperature of at least 321C should receive standard resuscitation, including CPR if in cardiac arrest67,120 (1C). If there is ROSC, the victim should be transported to the nearest hospital that can manage any associated injuries (1C). An avalanche victim who was buried more than 35 minutes or who has a core temperature less than 321C and has detectable vital signs should be transported to the nearest hospital or rural clinic for active rewarming (1C). If there are no vital signs and the airway is patent, CPR should be started67 (1B). An avalanche victim in cardiac arrest with an airway that is definitely obstructed should not be resuscitated if burial time was greater than 35 minutes or core temperature is less than 321C67 (1C). If there is any chance that the airway was patent, a short trial of CPR is warranted (1B). 64. An avalanche victim with CPR in progress should be transported to a hospital with the capability of performing extracorporeal rewarming if possible (1B). If it is not practical for the patient to go directly to a hospital that can perform extracorporeal rewarming and serum potassium has not already been measured, the patient should be transported to a hospital or clinic capable of measuring serum potassium (1C). Resuscitation should be continued only if serum potassium is 12 mmol/L or less (1B). 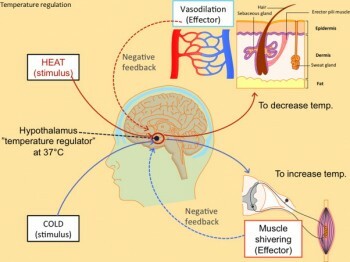 Objective: To compare 5 active torso-warming modalities in a human model of severe hypothermia with shivering heat production inhibited by intravenous meperidine. Methods: Six subjects were cooled on 6 different occasions each, in 8°C water, for 30 minutes or to a core temperature of 35°C. 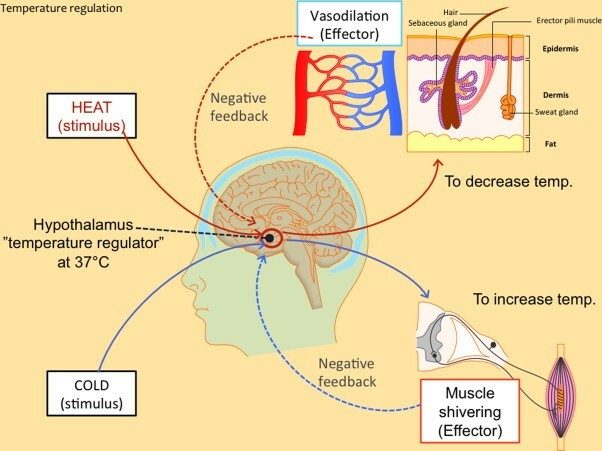 Spontaneous warming was the first torso-warming modality to be tested for every subject, and results served both as a comparative control and for determination of the meperidine dose for subsequent trials. Meperidine (1.5 mg/kg) was administered during the final 10 minutes of immersion to suppress shivering. Subjects were removed from the water, dried and insulated for 30 minutes, followed by 120 minutes of 1) forced-air warming with either a 600-W heater and commercial soft warming blanket; or 2) a 600-W heater and rigid cover; or 3) an 850-W heater and rigid cover; or 4) a charcoal heater on the chest; or 5) direct body-to-body contact with a normothermic partner. Supplemental meperidine (to a maximum cumulative dose of 3.2 mg/kg) was administered as required to inhibit shivering. Results: The initial post-cooling afterdrop was approximately 1.0°C. After 30 minutes, core temperature continued to drop by 0.45°C in spontaneous and body-to-body warming modalities. This post-warming afterdrop was significantly less with 600-W heater and rigid cover and the charcoal heater (0.26°C) and the least with 850-W heater and rigid cover (0.17°C). Core rewarming rates were highest using 850-W heater and rigid cover (1.45°C/hr), with charcoal heating and 600-W rigid heater (0.7°C/hr), 600-W heater and blanket (0.57°C/hr) and body-to-body warming (0.52°C/hr) being more effective than spontaneous warming (0.36°C/hr). Conclusions: In non-shivering subjects, external heat application was effective in attenuating core temperature afterdrop and facilitating safe core rewarming; this was more evident when heat was delivered preferentially to the chest, and dependent upon the amount of heat donated. The modalities studied appear sufficiently practical and portable for pre-hospital use and should be considered for such situations, particularly in rural or wilderness locations where anticipated transport time to the hospital exceeds 30 minutes. 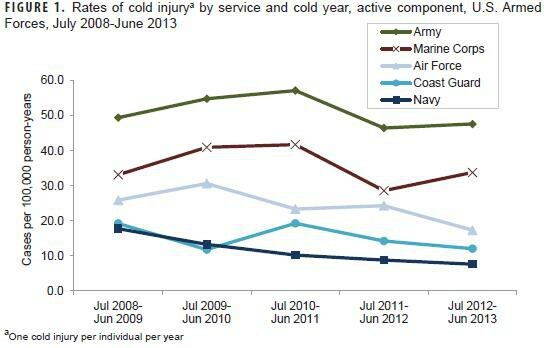 Cold weather injuries, active and reserve components, U.S. Armed Forces, July 2008-June 2013. Hypothermie: Isoler étanche même mouillé est efficace ! 1. Le fait d'envelopper un organisme dans un contenant limite les pertes thermiques par évaporation . 2 Il est meilleur de multiplier les couches d'isolation. Il est fondamental que cet isolement soit parfaitement ETANCHE à l'air. 1. La mise en place d'un écran interne au contact du blessé pour réduire les pertes thermiques par RADIATION (pertes thermiques par émission de rayonnement infrarouge, 50%des pertes) et par EVAPORATION (perte de calorie liée au changement d'état des molécules d'eau) (cutanée: 22 % des pertes et également respiratoire: 10 % des pertes) ainsi qu'en en protégeant les couches externes d'isolation de la transpiration et ou des défécations qui pourraient alors majorer les pertes par conduction. Ex: Une couverture de survie. 2. L'emballage par au moins 2 couches d'isolation interne pour permettre d'emmagasiner de la châleur. Ex: un sac de couchage ou des couvertures. 3. La mise en place de chaufferettes sans contact direct avec la peau pour permettre un réchauffement externe sans occasionner de brûlures cutanées. 4. Une couche externe étanche à la vapeur réduit les pertes par EVAPORATION en protégeant les couches internes d'isolation de l'eau externe (pluie, neige, humidité du sol) et réduit les pertes par CONVECTION (15 % des pertes, liée au vent. Ex une couverture de survie. 5. L'isolation du sol réduit les pertes par CONDUCTION (transfert de calories par contact direct entre deux corps, 3% des pertes ). Ex: un tapis de sol. Richards GM et Al. Int J Occup Saf Ergon. 2008;14(1):69-76. Il est recommandé lors de la prise en charge de blessés hypothermes de remplacer leurs vêtements humides par de vêtements secs. Ceci permettrait d'éviter l'aggravation de l'hypothermie secondaire à un transfert accru de châleur par conduction et par évaporation. Ceci est loin d'être toujours réalisable. Il convient dès lors de réaliser un isolement particulier du blessé basé sur latechnique de Hibler et dont la couche externe doit être ETANCHE à l'air. Ceci est connu depuis longtemps (ref ici). Le document proposé explique cela. Une couche externe ETANCHE réduit les pertes thermiques évaporatives. Un revue très synthétique à lire, notamment le paragraphe portant sur le recours à une hypothermie induite en cas de traumatisme sévère. 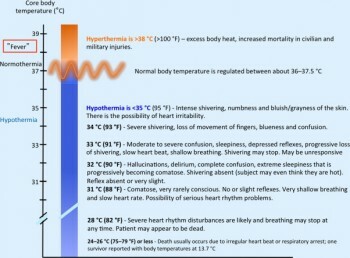 Generally, hypothermia is defined as a core temperature <35°C. 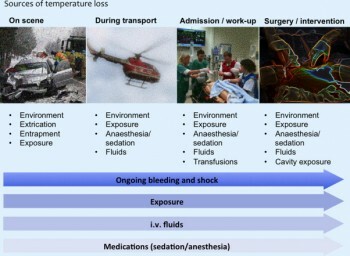 In elective surgery, induced hypothermia has beneficial effects. It is recommended to diminish complications attributable to ischemia reperfusion injury. Experimental studies have shown that hypothermia during hemorrhagic shock has beneficial effects on outcome. 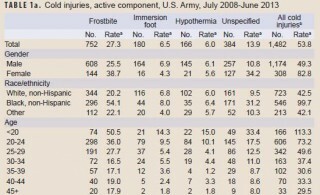 In contrast, clinical experience with hypothermia in trauma patients has shown accidental hypothermia to be a cause of posttraumatic complications. 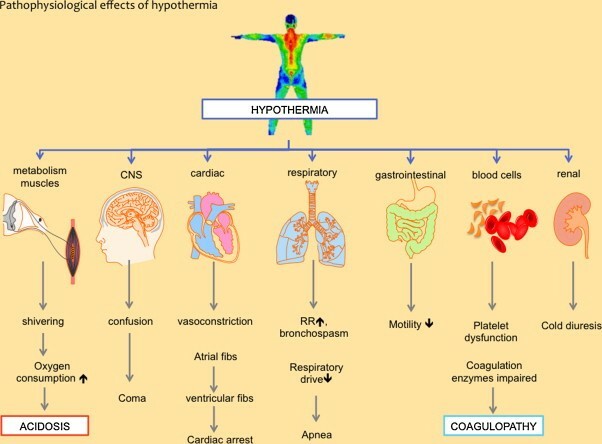 The different etiology of hypothermia might be one reason for this disparity because induced therapeutic hypothermia, with induction of poikilothermia and shivering prevention, is quite different from accidental hypothermia, which results in physiological stress. Other studies have shown evidence that this contradictory effect is related to the plasma concentration of high-energy phosphates (e.g., adenosine triphosphate [ATP]). 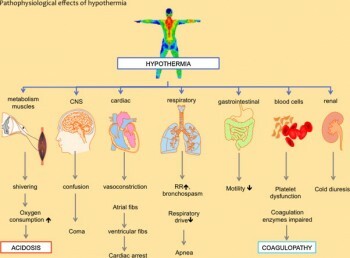 Induced hypothermia preserves ATP storage, whereas accidental hypothermia causes depletion. Hypothermia also has an impact on the immunologic response after trauma and elective surgery by decreasing the inflammatory response. This might have a beneficial effect on outcome. Nevertheless, posttraumatic infectious complications may be higher because of an immunosuppressive profile. Further studies are needed to investigate the impact of induced hypothermia on outcome in trauma patients. Lundgren P, Henriksson O, Widfeldt N, Vikström T. Insulated Spine Boardsfor Prehospital Trauma Care in a Cold Environment. International Journal of Disaster Medicine 2004;2:33–37. Henriksson O, Lundgren P, Kuklane K, Holmér I, Björnstig U. Protection Against Cold in Prehospital Care – Thermal Insulation Properties of Blankets and Rescue Bags in Different Wind Conditions. Prehosp Disaster Med. 2009;24(5):408–415. Henriksson O, Lundgren P, Kuklane K, Holmér I, Giesbrecht G, Naredi P, Björnstig U. 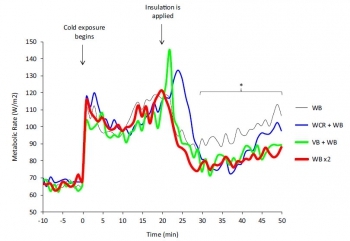 Protection Against Cold in Prehospital Care – The Effect on Thermoregulation by Wet Clothing Removal or Addition of a Vapour Barrier in Shivering Subjects. Manuscript. On utilise souvent une couverure aluminisée comme moyen deprévention de l'hypothermie? Cette façon de faire est peu efficace et doit être remise en questoin surtout en présence de vent, ce qui est habituel lors d'EVASAN Hélico. Il est alors fondamental d'avoir recours à des protections étanches non compressibles par le vent ambiant. Le retrait des vêtemenst humides n'apparaît pas être nécessaire si ces conditions sont obtenues. La prévention d'une hypothermie est fondamentale en médecine de l'avant. Mais quel moyen utiliser ? Le travail présenté met en avant la performance de la couverture triple couche, de la ready heat mais aussi celle de l'association Couverture renforcée et Ready heat. Il met aussi en avant le risque de brûlure localisée avec la ready heat et celui de son délai d'action d'une trentaine de minutes. Ready heat ou triple couche ? The effect of active warming in prehospital trauma care during road and air ambulance transportation - a clinical randomized trial. Lundgren P. et all Scand J Trauma Resusc Emerg Med. 2011 Oct 21;19:59. La prévention de l'hypothermie fait appel à des moyens de réchauffement cutanés passifs ( couverture renforcée type Rothco ou la couverture triple couche type blizzard blanket ) ou actifs (couverture ready-heat). Mais comment choisir ? Le travail présenté ici démontre qu'en présence d'une hypothermie modérée supérieures à 35°C il n'est pas utile d'avoir recours à un moyen actif en terme de limitation de l'hypothermie dès lors que le frisson est conservé. Le seul gain porte sur un confort thermique accru. 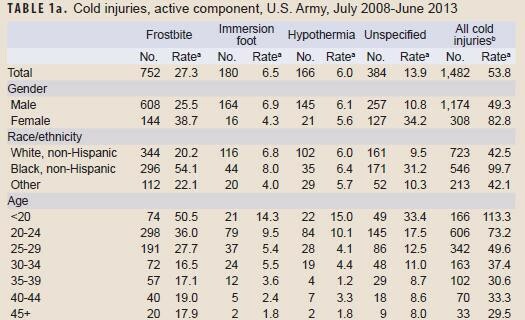 Prevention and treatment of hypothermia by active warming in prehospital trauma care is recommended but scientific evidence of its effectiveness in a clinical setting is scarce. The objective of this study was to evaluate the effect of additional active warming during road or air ambulance transportation of trauma patients. hypothermie: Isoler le blessé du brancard ! Les phénomènes de conduction ne doivent pas être négligés dans la génèse de l'hypothermie. 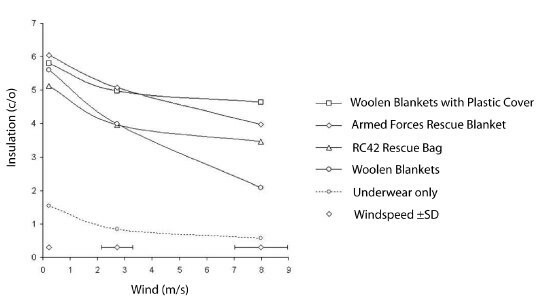 Assessment of Hypothermia Blankets Using an Advanced Thermal Manikin. Elles sont efficaces. Elles ne doivent JAMAIS être placées au contact direct de la peau.